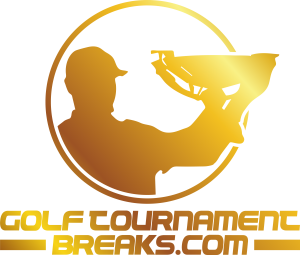 Book a golf break in the US and watch The Waste Management Phoenix Open too! Detailed travel docs with dinner and entertainment recommendations. DEPARTURE TIME To arrive at least 2 hours before the flight. ADDITIONAL NIGHTS: (pre- or post tour) including breakfast, fees and taxes can be arranged. Alternatively, private transportation can be arranged. 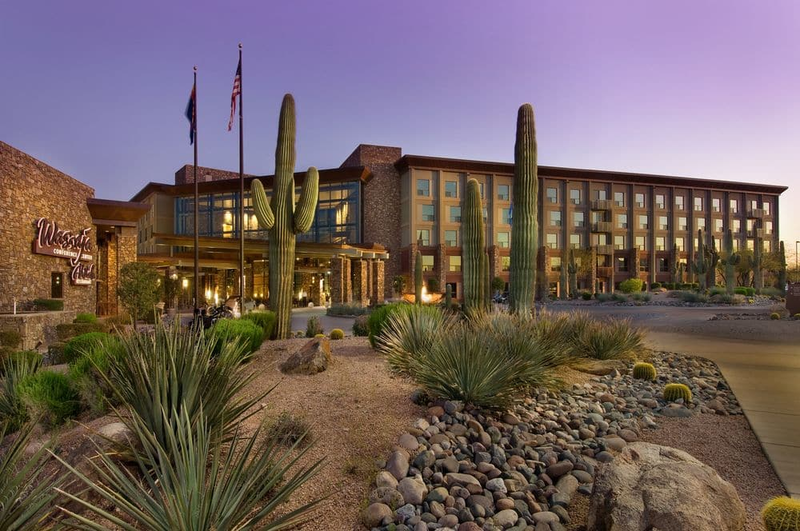 Discover the beauty, tranquillity and culture of Arizona’s captivating and pristine Sonoran Desert at the AAA Four Diamond We-Ko-Pa Resort & Conference Centre! The award-winning resort is located only 20 minutes from Phoenix Sky Harbour International Airport and offers spectacular views of Arizona’s majestic Four Peaks and iconic Red Mountains alongside the free-flowing Verde River. In the native language, the name “We-Ko-Pa” means “Four Peaks” and honours these regal lands while paying tribute to the diverse and vibrant heritage of the Yavapai Tribe. The luxurious We-Ko-Pa resort features 246 beautifully appointed rooms, a sparkling outdoor pool, the exciting Fort McDowell Casino, a state-of-the-art Amethyst Spa and Fitness Centre and most important – two unique championship golf courses. 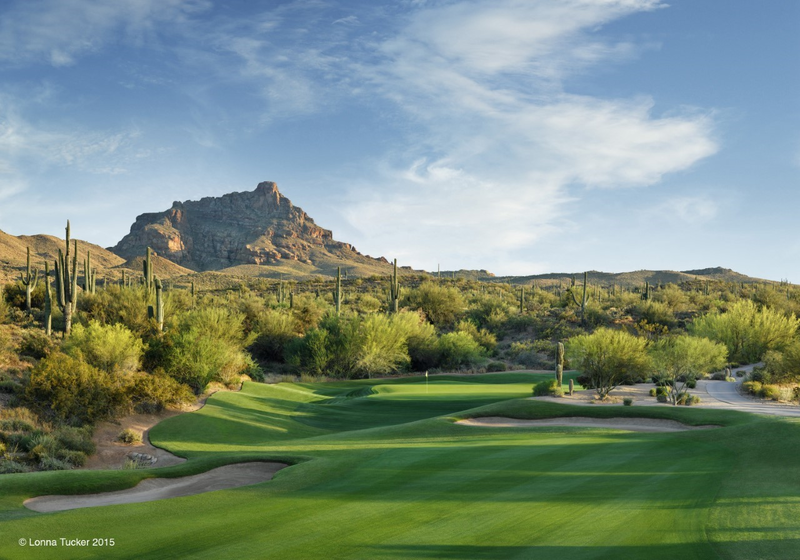 No matter whether you tee-it up on the fantastic Cholla Course, Arizona’s #1 golf course, or the newer Saguaro Course, you’re in for a desert golf experience unlike any other in Arizona. Unlike other Arizona golf courses, there are no homes, condos or town homes lining the fairways, it’s just you, your ball and good old Mother Nature. Fabulous dining at seven restaurants, including tantalizing Southwestern-inspired cuisine can be enjoyed at the award-winning Ahnala Restaurant. 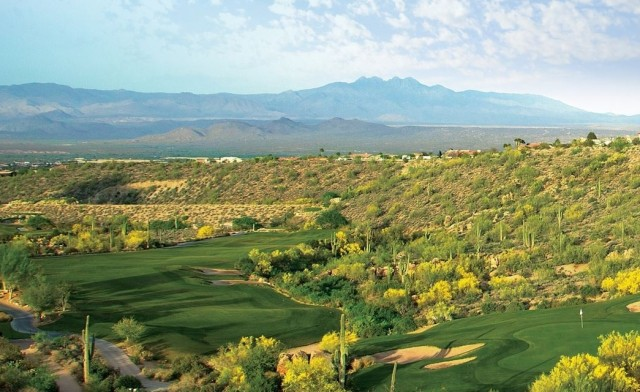 Nestled in the ravines of Arizona’s McDowell Mountains and colorized by dramatic sunrises and sunsets, Eagle Mountain beckons those who desire an outstanding golf experience. Opened in 1996, this Scott Miller designed course is a spectacular representation of man’s creation in harmony with nature as it winds through natural box canyons, rolling hills, and lush desert valleys. The elevation changes found throughout the golf course add an element of beauty and challenge to the layout as it plunges through thickly vegetated arroyos and sweeps across sun-drenched desert ridges. Desert comes into play throughout the round with bold as well as conservative options baked into a design that is more forgiving than it appears. Several of the corridors slope toward the centre of the fairways providing a helpful kick. However, the other side usually falls dramatically into Saguaros, Mesquites, Palo Verdes and all manner of wildlife. “The People’s Open” is the best-attended golf tournament in the world and has gained legendary status for being the most unique stop on the PGA TOUR. The 2018 tournament set a new record for attendance with 719,179 spectators for the week. The 2019 edition will mark the 84th event (one of the five oldest events on the PGA TOUR). 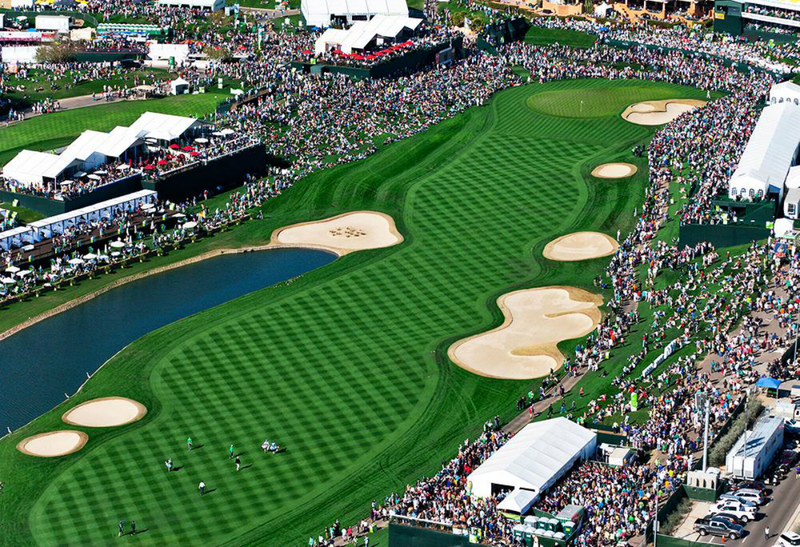 Can the party at the Waste Management Phoenix Open top 750,000 in 2019? For four nights every year the hottest nightclub in Scottsdale – he Birds Nest – is located inside a tent next to TPC Scottsdale. With its great music, beautiful patrons and enthusiastic partying, the Coors Light Birds Nest has earned near legendary status on the PGA TOUR. It offers a show all its own. Gates open at 3:30pm and the headliner takes the stage at approximately 8:30pm each night. Tickets can be pre-arranged. VIP ADMISSION includes hosted bar and catered buffet. The Cholla Course offers a dramatic test of golf that plays through shady arroyos, over desert ridges and amid some of the most picturesque Sonoran Desert on the planet. For this reason, Cholla is widely considered as one of the most pristine desert golf experiences in the Southwest with no homes or other development to spoil the sweeping views of the nearby river valleys, Red Mountain, Four Peaks and the rest of the majestic Superstition Mountains. 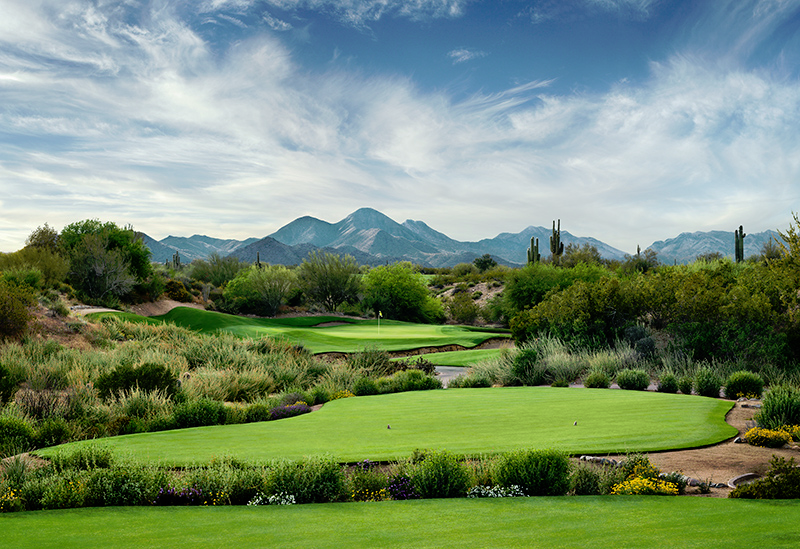 The aesthetic charm of Cholla appeals to golfers just as much as its strategic challenge. Designed by Scott Miller, Cholla has racked up a host of honors on its way to becoming one of Arizona’s most celebrated courses. In fact, the 7,225-yard layout was named by Sports Illustrated as one of the “10 best new public courses in the world” shortly after its debut. More recently, Golf Magazine listed Cholla as No. 46 in its ranking of the “Golf’s Top 100 You Can Play” for 2016/2017. Golfweek bestowed Cholla with three “Golfweek’s Best” honours: 20th in 2016 Casino Courses ranking; No. 66 in the list of the Resort Courses for 2017; and 9th in the 2016 State-by-State Courses You Can Play in Arizona ranking. Old Town Scottsdale has more than its fair share of countless excellent restaurants and lounges. Scottsdale’s nightlife has earned the nickname “South Beach in the desert”. After enjoying the city´s culinary delights, hit an endless list of hot spots ranging from trendy dance clubs to chic bars. This is the place where visiting celebrities, wealthy fashionistas, and wannabes come to party. Hideki Matsuyama can claim two back-to-back victories – in 2016 and 2017. In 2016 the 24-year-old Japanese phenom could beat Rickie Fowler in a play-off. In the final round of the 2017 Waste Management Phoenix Open, Hideki Matsuyama holds off Webb Simpson in a 4-hole playoff to claim his 4th title on the PGA TOUR. In 2018, Gary Woodland closed with a 64 and won the Waste Management Phoenix Open in a playoff. Will he be able to defend his title as well in 2019? Witness excitement and drama at this unique tournament! Minneapolis was treated to an unforgettable Super Bowl between the Eagles and Patriots. Watch the Super Bowl LIII at the Mercedes Benz Stadium in Atlanta at one of our TOP 10 recommended locations in Scottsdale. It will be an unforgettable experience, guaranteed! Bill Coore and Ben Crenshaw teamed up to design and build Saguaro, as they did with many other highly touted courses such as Bandon Trails, Sand Hills, Friar’s Head, The Golf Club at Cuscowilla and Barnbougle Lost Farm. This fantastic course combines distinctive desert-golf traits with the timeless traditions of golf course design. It’s built for walking with greens situated near to the next tee. It follows the natural movement of the land; they didn’t move much dirt. And the playing corridors are wider when compared to target-golf design. 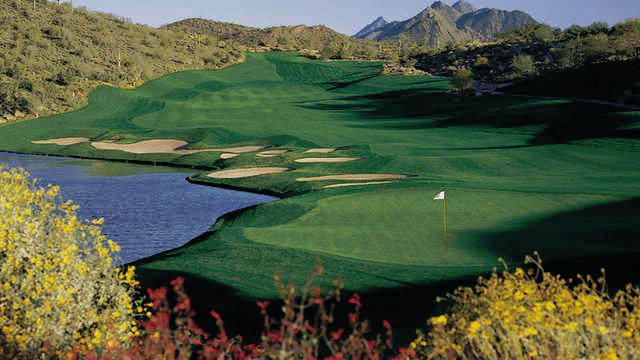 SunRidge Canyon’s 6,823-yard, par-71, Keith Foster-designed golf course unfolds around the rugged ridges and shady canyons unique to the desert mountains that divide Fountain Hills from Scottsdale. This unique golf course gradually descends on the way out before doubling back to climb up the slope on the way in. This subtle elevation change lies at the heart of the dramatic golf experience at SunRidge Canyon. You will quickly discover that this course wasn’t so much created by a bulldozer as it was carved out over eons by the relentless pressure of wind and water. Foster had the good sense to follow Mother Nature’s lead, and in the end, the beauty and challenge of SunRidge Canyon is unlike any other desert golf experience in the Valley of the Sun. Best of Phoenix 2016 by The Phoenix New Times.